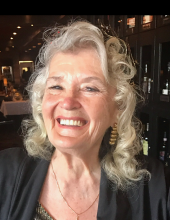 Lynda Areleene “Momma Bird” Kennedy, age 76 of Pontiac, passed away April 9, 2019 at home. She was born June 29, 1942 in Berkley to John and Alberta Wolff. Lynda was a devout Catholic, attending and supporting many of the local churches. She was a proud mall walker and gym rat. A workaholic, she worked two jobs most of her life to support her and her children. Mama Bird loved to “Shop Local” and support businesses in the area. She enjoyed spending time with her family from travelling the world to zip-lining and riding motorcycles, she wasn’t afraid to live her life to the fullest. Her zest for life will be greatly missed. She is survived by her children, Maria Brow, Robin (Elizabeth) Kennedy, and Michael (Elaine) Kennedy; her brothers, Ronnie (Cheryl) Wolf and Garry Wolff; grandchildren, Rosalio Nasianceno, III, Danielle Nacianceno, Amanda (Randy) Forgie, Veronica Munoz, Gracelyn Kennedy, Reese Kennedy, and Finley Kennedy; nine great grandchildren; and many loving friends and family. Preceding her in death are her parents and children, Reno Kennedy and Colleene Nacianceno. The family will receive friends Sunday 5-8 PM and Monday 2-8 PM with a 6 PM Rosary at the Sawyer-Fuller Funeral Home, 2125 12 Mile Road, Berkley (two blocks west of Woodward Avenue). Memorial contributions would be appreciated to St. Jude Children’s Hospital. To send flowers or a remembrance gift to the family of Lynda A Kennedy, please visit our Tribute Store. "Email Address" would like to share the life celebration of Lynda A Kennedy. Click on the "link" to go to share a favorite memory or leave a condolence message for the family.